I think I’m over garden shows and display gardens. There, I’ve said it. Fortunately there is a new alternative. When I attend garden shows, it’s mainly for the display gardens. I must say, I have enjoyed them, but when all is said and done, they are little more than a sugar hit, not very lasting. I’m not alone it seems. To fill the void, some enterprising and generous garden luminaries have invented the “garden fest”, a realistic alternative to the sometimes shallow world of display gardens. With “Hidden, Festival of Outdoor Design” set to rock Sydney in April, it’s possibly a good time to recall November’s Garden Design Fest in Auckland. 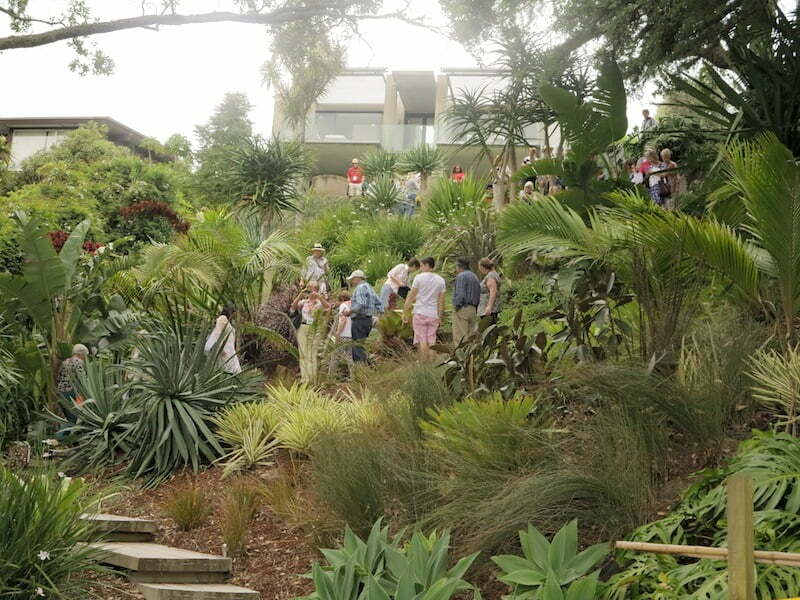 Melbourne has its Garden Design Fest, organised by Kew Rotary and New Zealand followed suit with its own Auckland Garden Design Fest. Both present real gardens, gardens that people love, garden and live in. 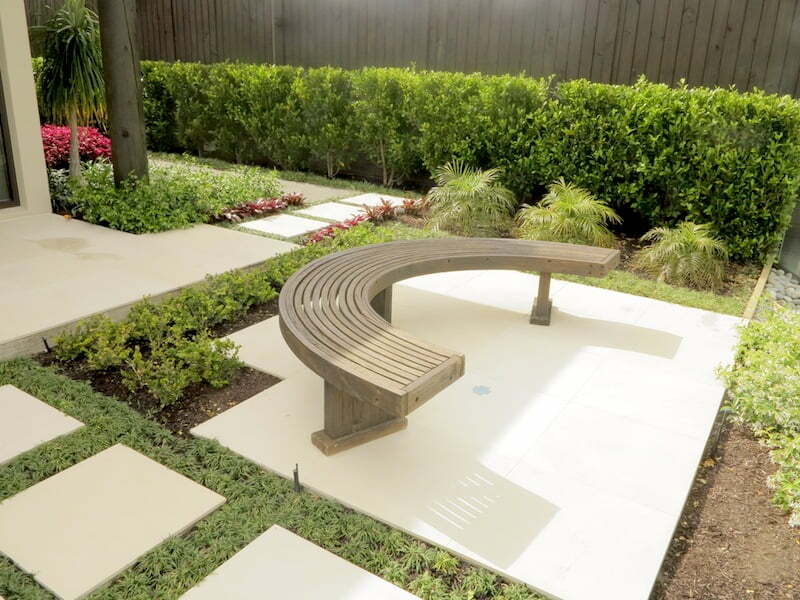 They are designed by people expert in their fields, garden designers and landscape architects who care about their clients, not multinational corporate sponsors concerned with presenting a singular commercial message. Both Auckland and Melbourne festivals are biennial; Melbourne in the even years and Auckland in the odd years (providing both continue). I visited Auckland last November (2013) and came away pleasantly surprised. I have visited the city on and off since the early 90s and seen its garden culture change over the years. 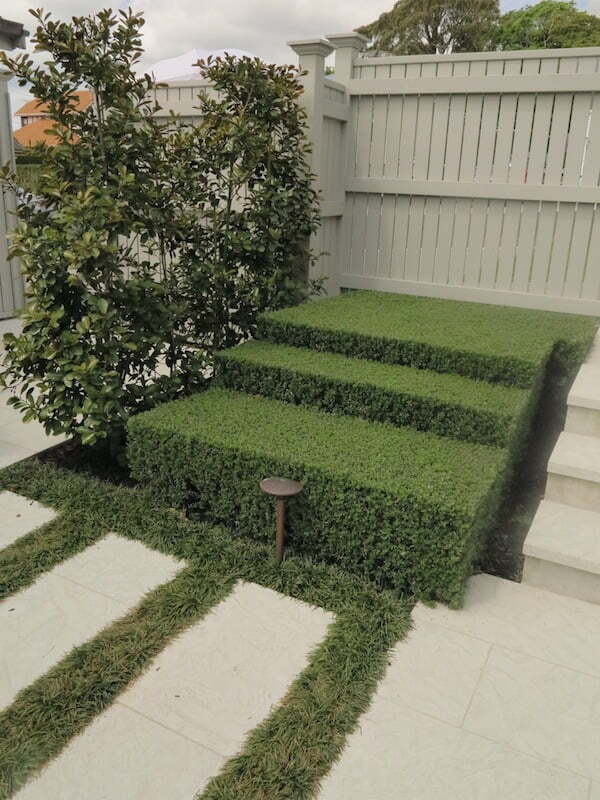 Presenting gardens by top Auckland designers, it provides a good cross-section of modern Auckland design, ranging from the very formal to the slightly quirky, much like Auckland’s overall art scene itself, a nice balance between style and fun. As with Hidden, there is a blend of established designers but also up-and-coming ones keen to present their skills and abilities. It’s also an opportunity to see a wide range of different approaches to the manipulation of space and there is something to suit different tastes. Even when you come to one that is just not you, there is always the chance to put your critical faculties into gear and that’s not a bad thing. Let’s hope Hidden is as big a success as the Melbourne and Auckland festivals. In the following gallery, you’ll see a sample of the Auckland gardens on show. The next festival is scheduled for November 2015. This is a large garden featuring formal design but on several levels with a games room and large vegetable garden on the lower terrace below the pool. The brief was to design a garden that respected the character of the property and the herigage of the house. 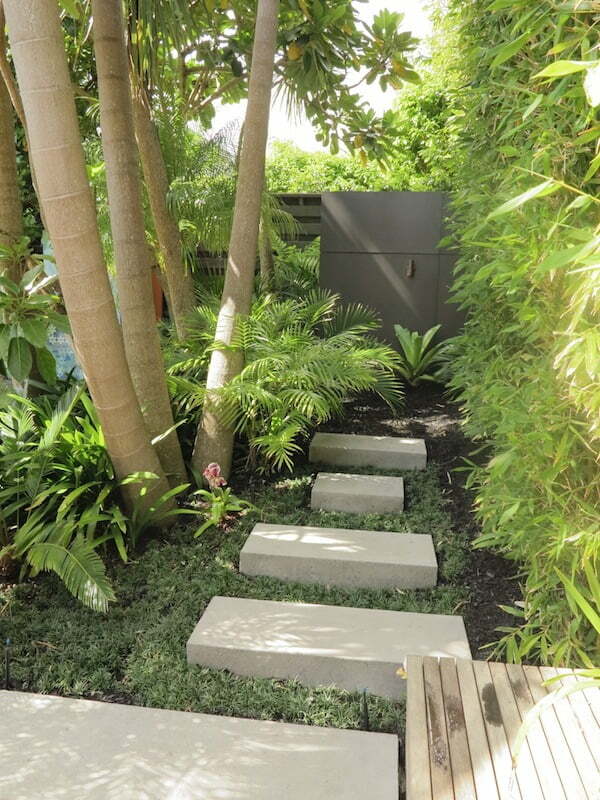 A small garden remodelled around an Arts and Craft house, this garden has a modernist feel using existing palms, subtropical understorey and bold paving and decking options for outdoor enjoyment. 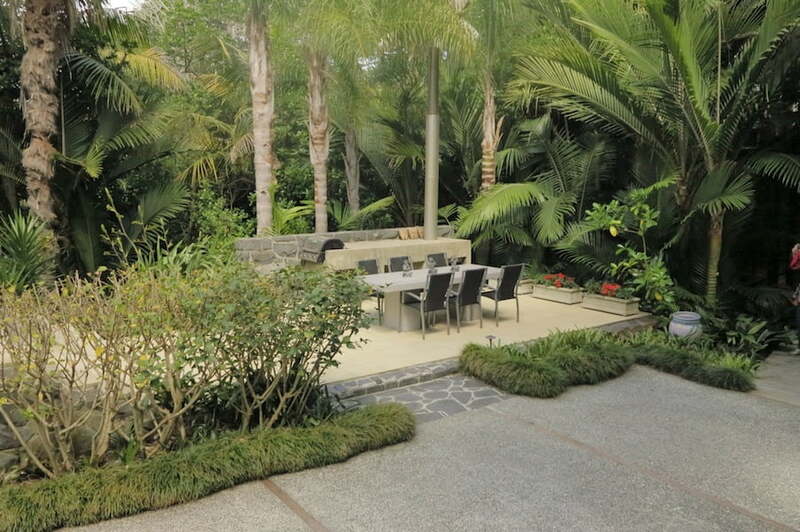 Demonstrating excellent transitions between indoor and outdoor living spaces, Deb’s garden is located on a double sized block with a huge rear section, still relatively “undesigned”. The front and pool areas are filled with exotic palms and bold foliage plants combined with a number of indigenous rainforest plants. 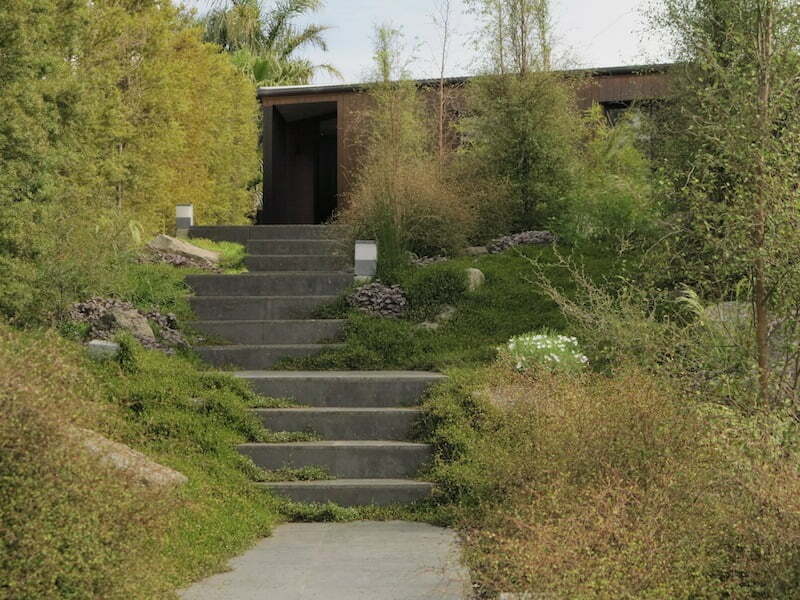 A coastal garden slopes steeply from the rear. 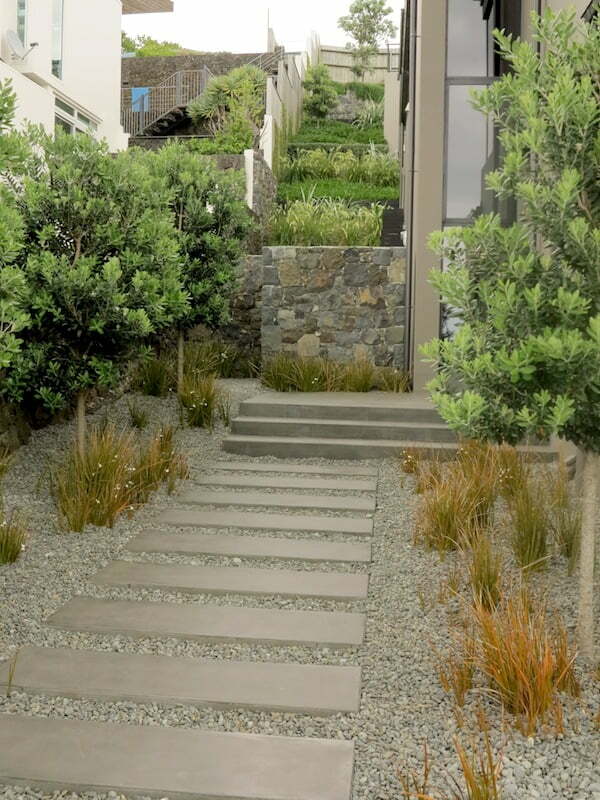 The house is anchored into the hillside with terraces and using a mix of exotic and indigenous New Zealand plants. The planting is arranged to highlight the wonderful views. 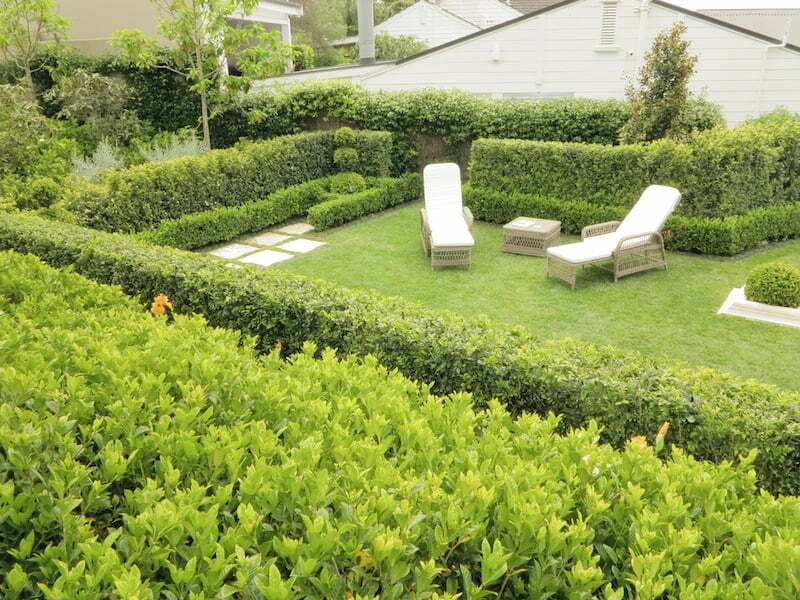 This sharply designed space includes a swimming pool and terraced areas marked by stepped hedging and precise espaliered firethrn (Pyracantha species). 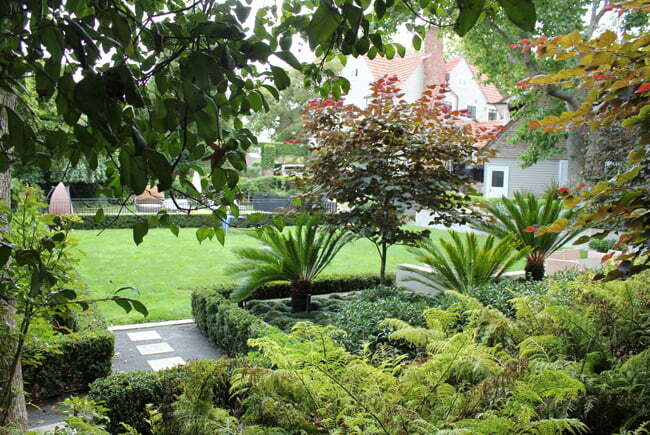 Cloud-pruned junipers, westringia hedges and fruit trees with bird of paradise give this formal garden a modern edge. Located at the base of an Auckland landmark, One Tree Hill, the rear of the garden fronts sheep paddocks providing a unique urban-rural edge and blue sky outlook. 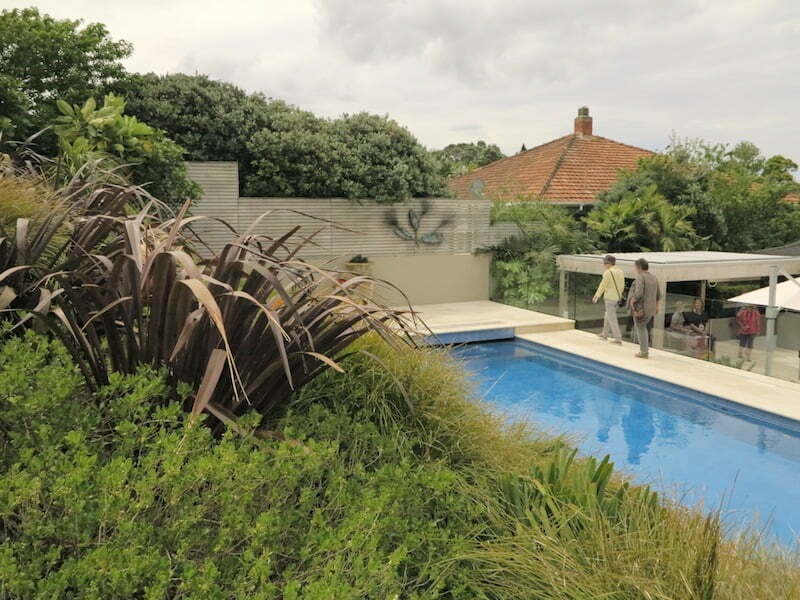 A slope above the swimming pool is planted with New Zealand plants including totara, phormium and grasses. Decorative ceramic elements add a charming artistic sensibility. An imposing house on a sloping site provided interesting design problems. The front is an entrance garden featuring irregular geometric terraces filled with agapanthus Hollywood junipers but it is the rear where the garden is designed on a more human scale. A well grown lawn sets the scene for a more traditional approach with a compact vegetable garden, utility area and comfortable seating space. Espaliered fruit trees and flower borders complete the scene. 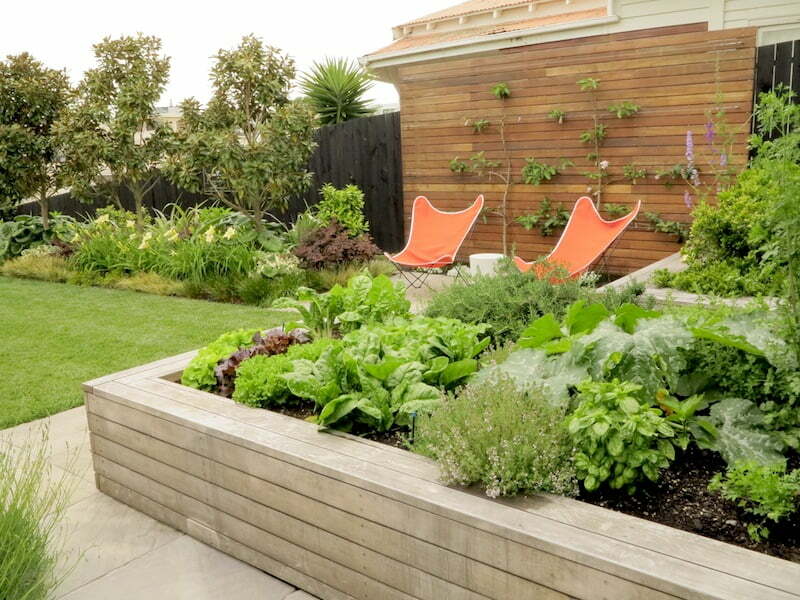 With room for only small perimeter plantings, this garden closely resembles modern Australian housing stock. Thickly planted with zigzagging paths and outdoor seating, it shows how a densely planted space can actually seem larger. 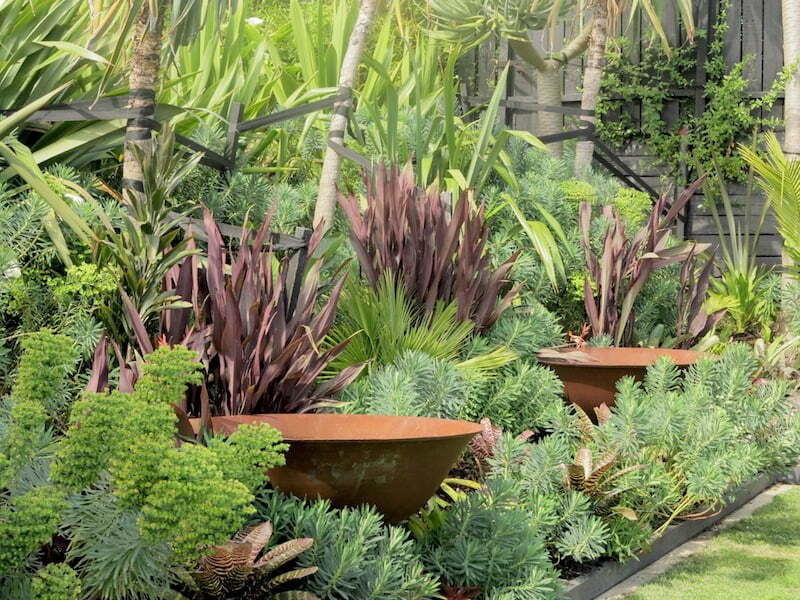 This thoroughly contemporary garden was one of my favourites. 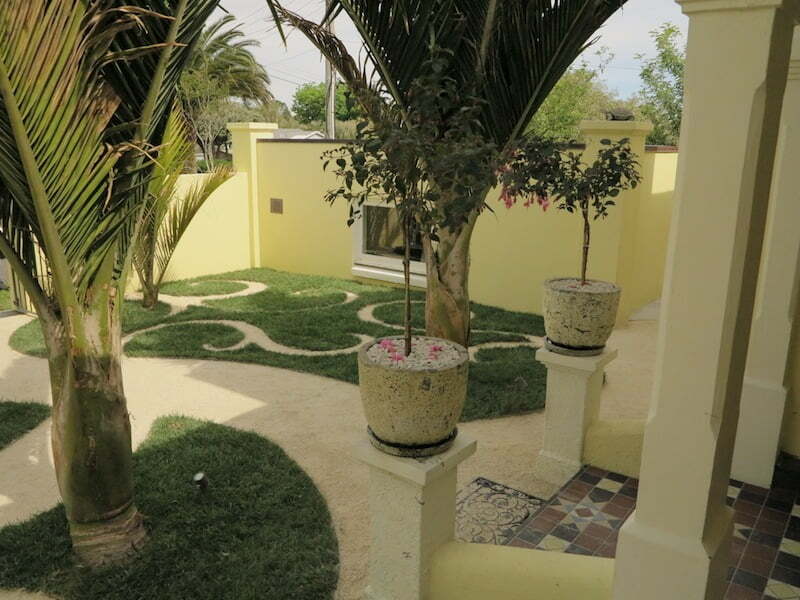 From the front entry with its koru-like pattern made from mini-mondo and shell mulch to the side passage and rear garden set well below the rest of the property, there is much to take in. Ball shaped lemons and massed cordylines give it a modern edge. A resort style garden with a harbour backdrop, this owes much to Balinese-style pool designs. Palms and bromeliads give it a subtropical feel. A very large garden using traditional formal elements like mondo between pavers, curved steps and large lawn areas, the most endearing element for me was a bronze statue of a Leunig-like businessman. A semi-circular parterre is home to the vegetable garden. Trish is one of Auckland’s premier designers and her signature seems to be a relaxed domestic style incorporating rich subtropical plantings and comfortable indoor-outdoor transitions. Judging by the two gardens on show, both neighbours, she also has a deft hand in the use of garden features including large corten bowls. This very dramatic garden fronts Lake Pupuke in Takapuna and features steep timber steps that wend down to the waters edge culminating with a timber deck and storage for kayaks. Planting theme is largely subtropical and a feature was the beautiful spear lily (Doryanthes palmeri). Author of several books including The New Native Garden and Small by Design; freelance garden and travel writer; in a past life was Editor of Your Garden and gardening editor of several Australian lifestyle magazines. Thanks Paul. 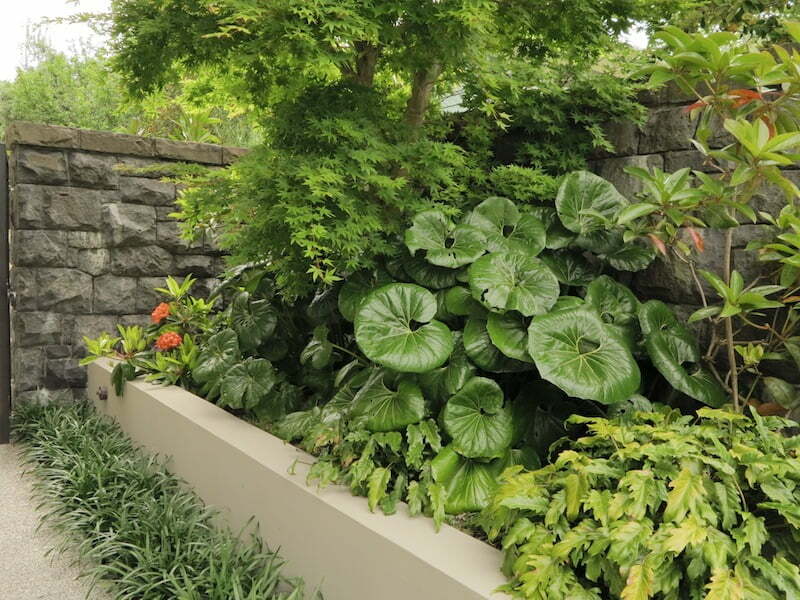 It is great to see photos of the Auckland GDF gardens and to read your views on them. I was hoping to go over and visit this event last year but couldn’t make it. It looked like it was a successful event. That would be great. 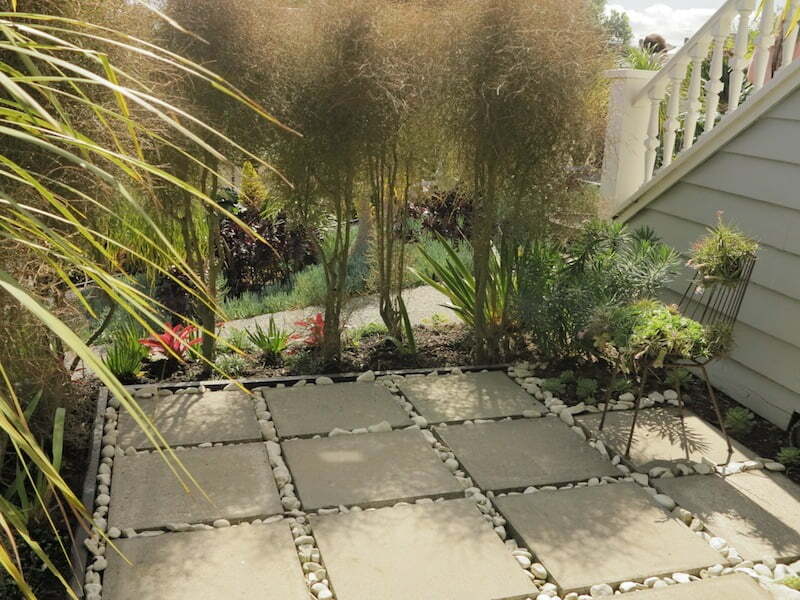 We’re working on 2015: check http://www.gardendesignfest.co.nz for updates. Thanks for your insightful overview Paul – we enjoyed having you and all the other Australians who came over. Best of luck with Hidden.